It is a Provencal restaurant,and they have over 84 vrieties of Pastis. Try the Camargue one, it was the best of the 4 we tasted. The food is delicious and so reasonably priced (but then, most things are by Sydney standards!!). We started wuth the plate of ratouille,anchoiade and tepednade,served with delicious bread, and we ate this with our pastis. We then moved on to fillet of perch poached with courgettes, a fillet of bar with a tian of vegetables, and a saddle of rabbit in mustard sauce. All absolutely delectable. Wine by the glass and it was all about 22 euros each. Excellent value! Back to the hotel through very cool Paris (about 4C) for an earlyish start tomorrow. We were picked up at the hotel at 10 and taken to CDG. We were quite early, but had a small drama going through security into the waiting area. I had completely forgotten that the pate and cheese knives I had bought in Venice, with Murano glass handles, were in the hand luggage. Of course, the scanner picked them up. The French security guard was very nice, I know she realised that they were expensive presents. She said the pate knives were OK as they were blunt and fat bladed, but the cheese knives had to go. She advised me to go back through customs and put the knives in a bag and check them through to Sydney, but that would mean unpacking one of the backpacks and lugging whatever was in that by hand – it was all too much trouble for 20E. So we lost the 2 knives, totally due to my forgetfulness. Sigh. The trip was pretty good, much better than coming over, and I think that was because we had the 5 hour delay in Hong Kong on the trip over. Without any delays, the trip home was fast and comfortable. We arrived back to a freezing cold night, and even though we put on all the heaters and all our coats, were not able to warm up for days. It's a very cold August, apparently. 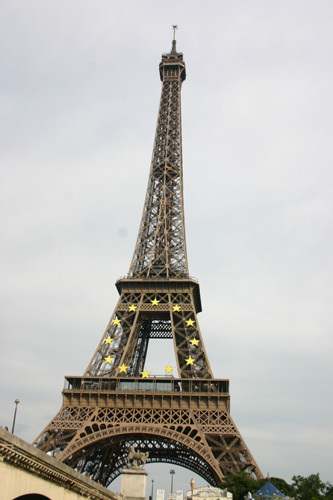 Well, today is actually 24th August, and I have just finished posting the last week in France. So how does it feel to be home again? I'll let you know another day. Last day in Paris!! 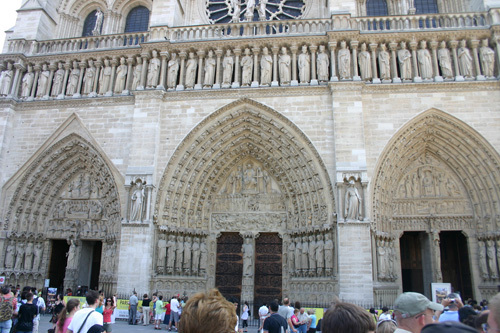 Panic is setting is as there's so much to see and do and yet one of the loveliest things to do in Paris is nothing!! We're going out without our friends today, as they have another 2 days here but we are panicking! 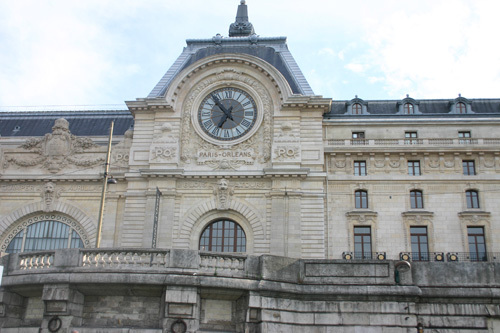 We catch the metro here and the Louvre is our first stop, except we all have to get off the train at Chatelet and get separated. J and I gt to the Louvre but no boys. We soon meet G, but N is missing for some time. Eventually we all meet up and buy out tickets. Now we split up. G and I go one way, J and N to visit the Greek and Roman section. 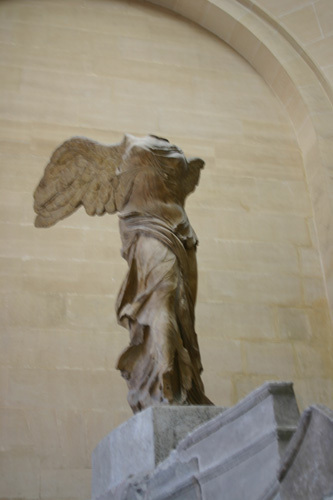 G and I separate for 40 minutes, and I visit the Italian masters while he looks for the Venus de Milo. 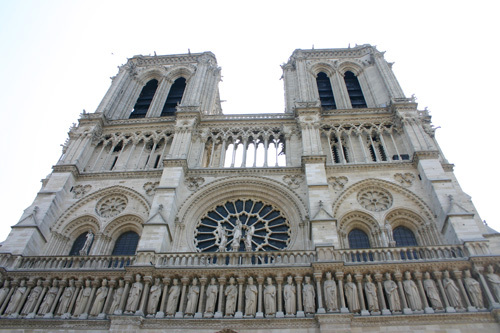 Back up into the daylight, and G and I meet up again and head for Notre Dame. We decide to walk from the Louvre, even though already my feet are killing me! It's pretty full, and there's a service going on, though any semblance of peace, quiet and reflective thinking seems a long-forgotten concept here. 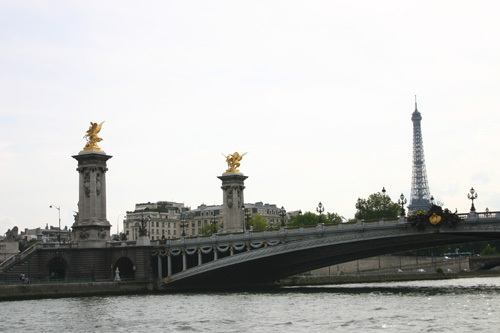 We leave eventually and cross the Seine to the Left Bank. the Rue de la Huchette and Rue St Jaques, all tiny and twisting and full of interesting shops and cafes – and people! 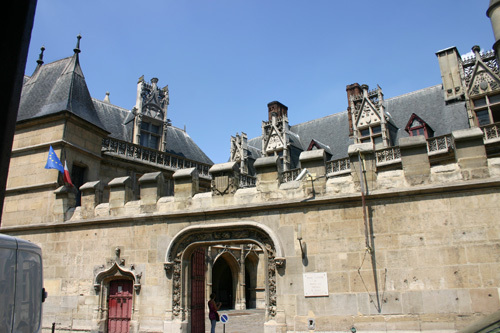 I am heading for the Musée de Cluny, as I've never seen the tapestries there. the facility is made of up a group of residences with two wings encircling a court. 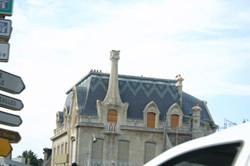 Its two stories are topped by a high slate roof dotted with dormers. 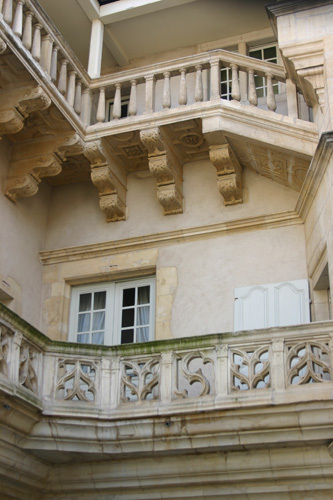 A balustrade with a heavy overhang hides its edge. The levels can be reached by three spiral staircases. 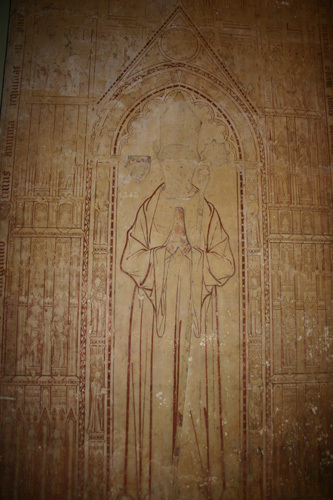 Inside, the hotel (de Cluny) has maintained its original layout: the size of the rooms, the façade and the chapel. 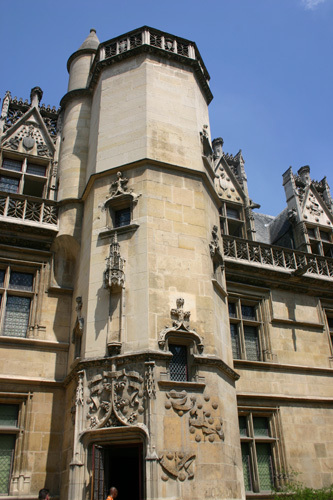 The Musée de Cluny is known as the Museum of the Middle Ages. 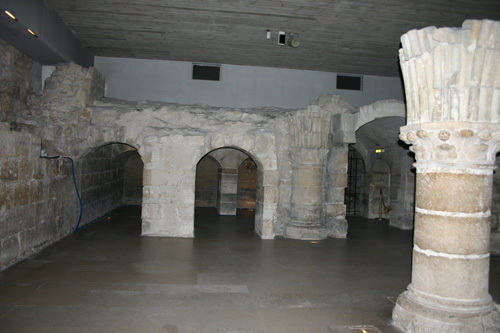 Many works of art and sculpture have been brought here from around France to show how people lived in the Middle Ages. 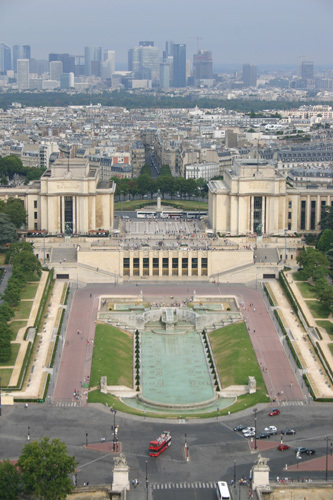 It is a most fascinating museum, and if you have never visited it you should definitely put it on your schedule for Paris. 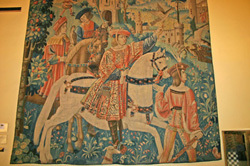 The most famous tapestries in the Musée de Cluny are the set known as The Lady and the Unicorn. 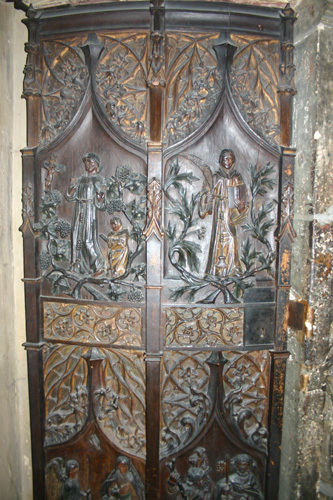 These were commissioned by a wealthy family in Bordeaux on the engagement of their daughter. 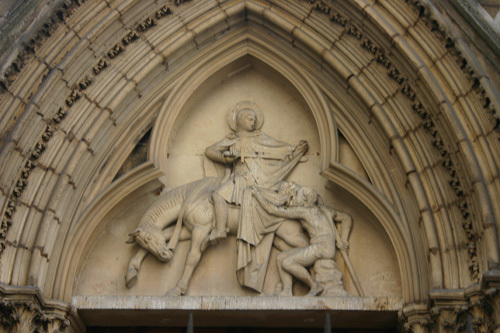 The unicorn symbolises the virginity and innocence of the lady. 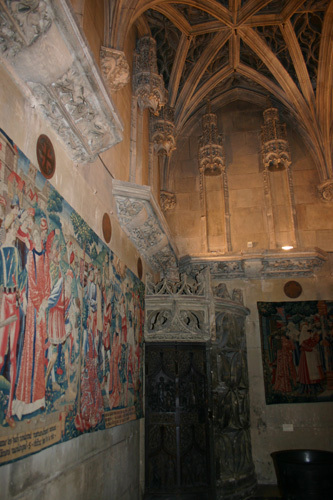 There are 6 tapestries, and 5 of them portray the different senses. Because there are so many photos on this page already, and more to come, I've created a separate page for these ones, which you can find here. 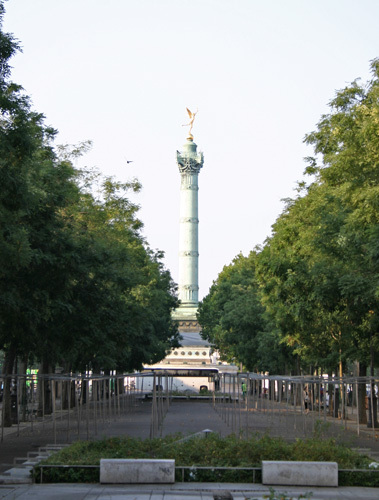 I then left and went for a little walk down the Boulevard St Germain, but I was too tired to shop. So I went back to the Citadines via the metro, and changed my shoes. After a small rest, I headed out again. 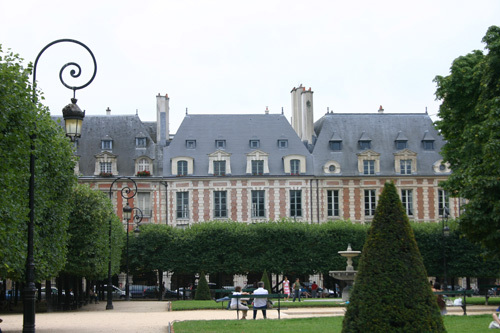 The first time I'd been in the Place des Vosges I hadn't had my camera, so I had some pictures to take! One of the interesting things (amongst thousands!) 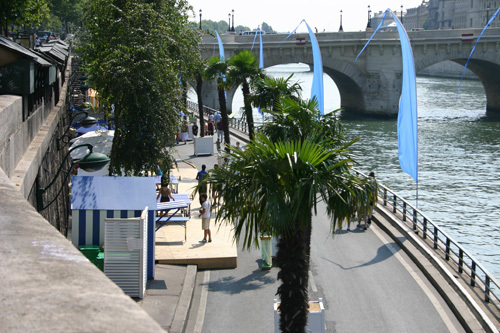 that happen in Paris during summer is that part of the banks of the Seine get turned into Paris Plage. Beach huts are set up, sand is strewn around, bars with sun umbrellas, sunbeds, live music, water, swimming pools, gelato bars – everything one needs to feel that one is at the beach!! It's really fun! 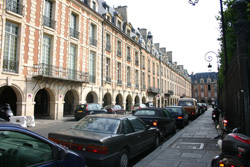 I left the hotel and walked to the Place des Vosges again. 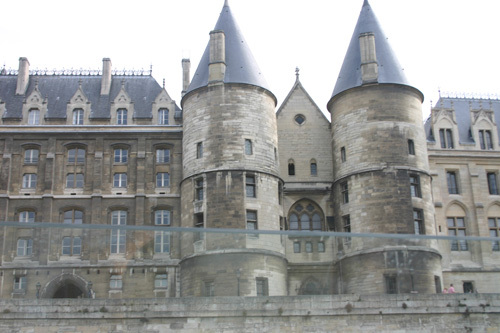 I walked through the Hotel de Sully, a 17thC palace which houses photographic exhibitions. 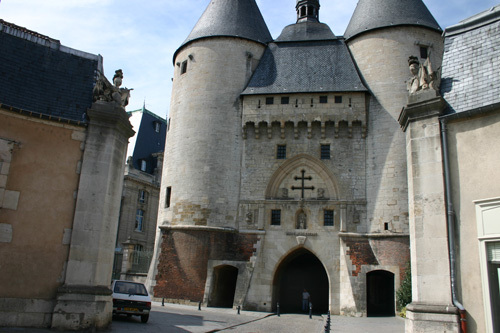 Here also is the headquarters of the Monuments Nationaux, which has reams of info about France's national monuments. this brings you out onto the Rue St Antoine and then its a quick walk to the Rue St Paul and on to the river, exploring the little interesting shops along the way. 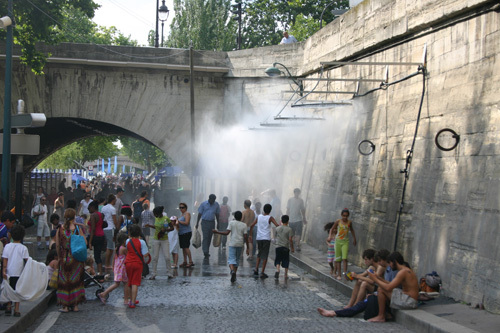 I walked along the river, though part of Paris Plage, then decided to catch the batobus. 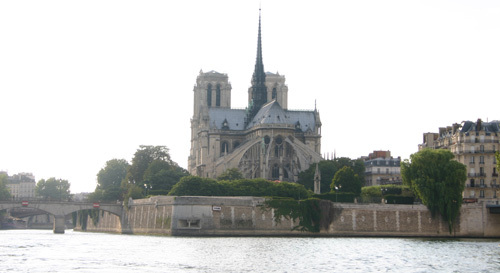 This is a boat that travels down one side of the Seine, from Hotel de Ville past the Louvre, the Champs Elysees, the Tour Eiffel, then up the other past the Musee D'Orsay, St Germain-des-Pres, Notre Dame and the Jardin des Plantes. You can hop on and off as many times as you like, for 11E for a day ticket. 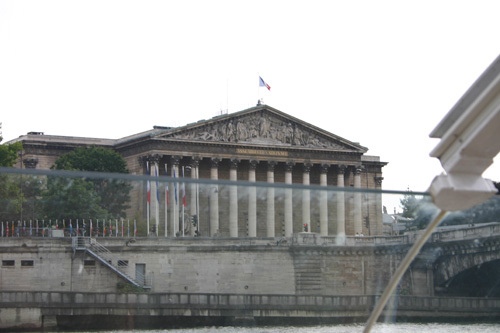 I hopped on at Hotel de Ville and stayed on until Jardin Des Plantes, which is near the Gare d'Austerlitz and from which the metro runs to Rue Richard Lenoir. Here are the sights I saw along the river. And then I walked home and collapsed!! We met up with our friends again around 9 for dinner at Enoteca, a Michelin-selected restaurant in St Paul. Sadly, it wasn't as good as Chez Guy, in fact the meal at Chez Guy would be the best meal we ate in France. It was strange to go to an Italian restaurant in France! The ambience was good, the service exceptionally kind and attentive. The food was good too, just not great. Anyway, it was still fun for our last night in France, the last night of our long 3 month holiday. We only have 2 full days in Paris. 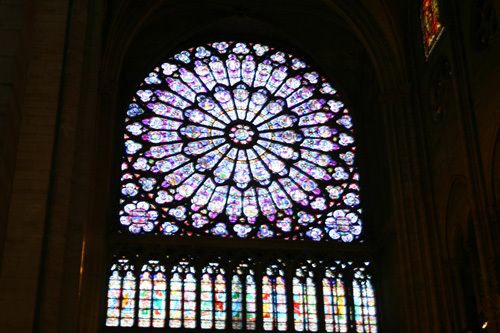 Today is Sunday, and the Tour de France is ending here in Paris today. We start out separately. 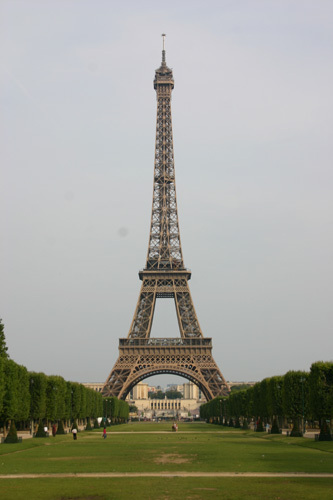 The boys get bikes and ride to the Eiffel Tower, then they intend to go to the Champs Elysee to get a spot for the race. 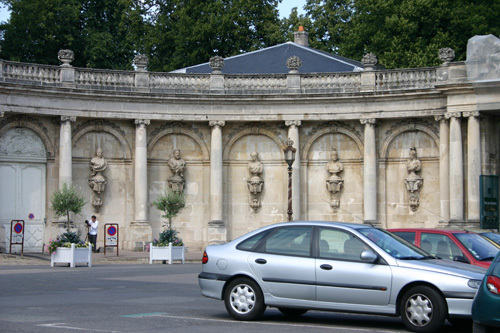 I meet up with our friends and the 5 of us go to the market in Place d'Aligre. While I am waiting for them I walk through the market that has been set up across the road in the park that separates both sides of the Rue Richard Lenoir. Its a huge market and I have a lot of fun looking at it. My friends arrive and we walk up Rue St Antoine to the market at Place d'Aligre. Its not bad, but nothing like the one I just left, and the daughter of my friends wants to buy some jewellery. So after a coffee we split up again, we three girls going back to the market near Bastille, and the other 2 heading off to get a spot to watch the Tour de France. 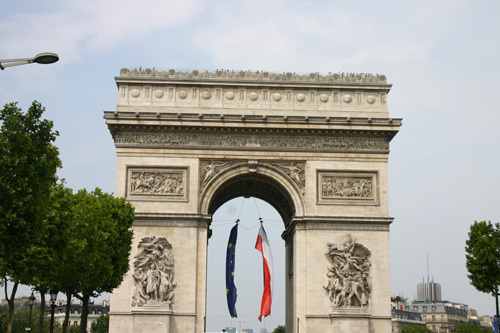 My boys are at the Arc de Triomphe end and my friends are intending to go to the Place de la Concorde end, with thousands of people in between. We girls take about an hour and a half to do the market, then we head to Bonne Soeurs for lunch. After lunch and a welcome rose, we decide to head for the Louvre. We sms the boys that that is where we will be and take the metro. We get out in the Louvre Carousel, a brand new shopping centre built under the Louvre. That proves irresistible to us, so after a couple of hours shopping we stop for a cafe near the entrance to the Louvre. Its 4.30 by this time, and my boys arrive to meet us, as there seems to be no sign yet of the Tour de France. 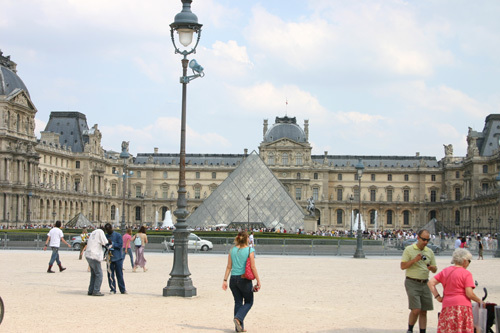 We decide its too late to go to the Louvre, as it shuts at 6, but we hear that the cyclists are coming. 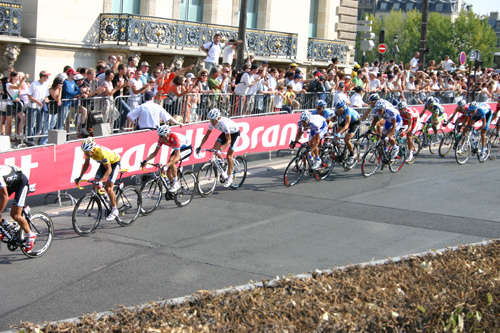 We race out into the Tuileries and catch the cyclists as they pass by! Our family heads home, and the 2 other girls go in search of their family members, still around the Place de la Concorde, I think. 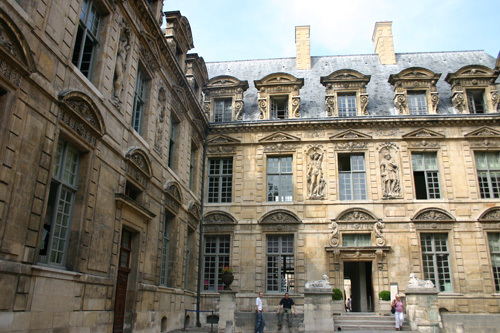 Later that evening we walk to their apartment in Rue de Bourg-Tibourg in the Marais. Its a Sunday night, and the place is jumping. All the bars and cafes are full, and they say they have to keep the windows and doors closed if they want some quiet. But its so colurful and full of life, such gorgeous people having such fun! We walk to Rue du Rosiers and find a great gay falafel place, where even the lights wear feather boas. The food is really good, plentiful and cheap, and its bursting at the seams. After dinner we feel like an ice-cream, but the queues are too long at all 3 places we try. Seems everyone has the same idea! Instead, we say goodnight to our friends and take a long slow walk home, looking at the interesting shops along the way, and arriving home well past midnight. Pity about the ice-cream! As you can see its covered in the ubiquitous concrete that all the houses seem to favour in this part of France. In the south, the lovely local stone is shown off, whether grey or golden. But here in the north the fashion seems to be to spray the houses with a concrete coat. Most of the older houses are thousands of shades of grey, while the newer ones favour pale gold, which is at least more attractive. The villages here are not as "pretty" as in the south, as the houses tend to be built up to the roads and sprayed with grey concrete. Many villages are just a collection of farm buildings. The shutters are not painted bright colours, and there's little in the way of flower boxes. I imagine its much colder and poorer here than the south. As well, the farms here are immense - in the south you would see a fields of wheat and dotted amongst them villages, churches and farms, but here in the north one field will extend as far as the eye can see in every direction, broken only by a line of trees along the hill top. So the population is not as dense, and farming is very intense. Then its on the expressway to Paris. The car has to be returned to CDG airport, so we head straight there. The road guide says its a 5 hour trip but we make it in 4. We have a map that shows us where the car has to be returned, but that doesn't seem to exist. We drive around terminals 2 and 3 a few times then eventually find something that resembles a car yard. We go in and ask, and yes this is it. We hand over the car and they call a taxi to take us to our hotel in Paris. An hour later we are checked in and ready to go!!! 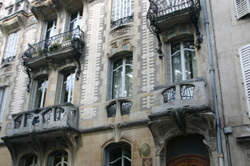 We are staying the Marais, in the Citidines Bastille, not far from Bastille station in Rue Richard Lenoir. Its on the edge of the Marais really. 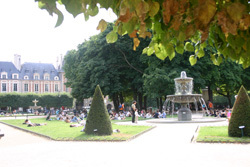 We have friends staying deep in the heart of the Marais in Rue de Bourg-Tibourg. 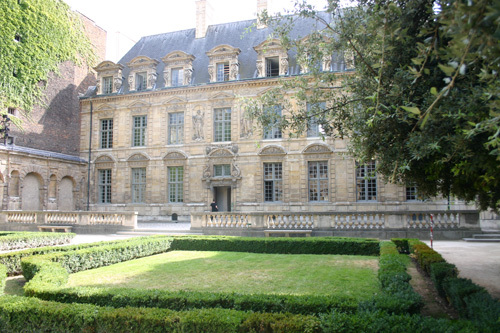 We arrange to meet in the Place des Vosges. 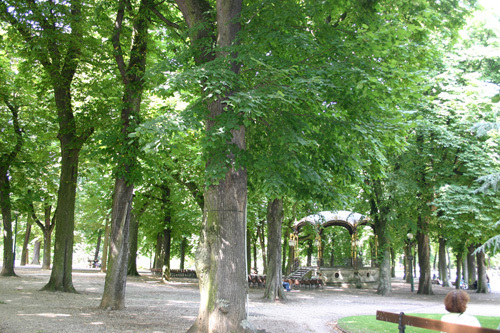 There is a park in the middle of this gorgeous square and beautiful buildings with colonnades all around. We find a great cafe for lunch (Bonne Soeurs, which we will re-visit a few times!) where we have fabulous salads and sandwiches. 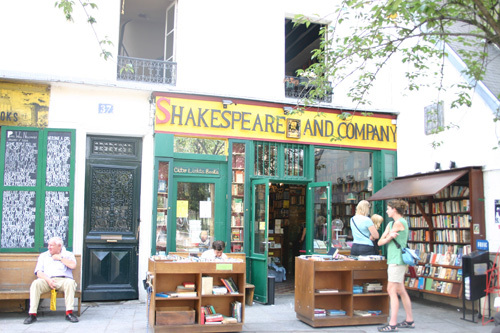 We meet our friends and go for a walk in the St Paul area of the Marais, to the Red Wheelbarrow bookshop as I am out of reading material. We buy some books and then go our separate ways for a while. Paris has bicycle racks all around the city for tourists to use. You simply insert your crd, take a (working) bike, ride wherever you want and then lock it into the nearest bike rack and go on your way. Such a great idea for getting around a city! We bought 3 cards, and the boys decided to head off for a test ride while I did some catching up on the internet. We had booked at Brasserie Bofinger, one of the most famous of Parisian brasseries, for dinner with our friends at 11pm, the only time they could take us. We'd been advised to try this by other Oz foodies. There is a famous art nouveau ceiling downstairs, and we glimpsed it as we were whisked upstairs to our table in the corner. I had a lamb stew, nothing really flashy, though the others enjoyed the meal very much. Including 2 bottles of wine between 4 of us, the bill was 350E for 8, not a cheap meal at all. Not really worth the price, I felt, but we were also paying for service, which was good, as well as the atmosphere. We left after 1, then 6 of us decide to head for a jazz bar. We went to the China Club in Rue de Charenton. It's an old classic, still going strong. It's decorated like a Hong Kong businessman's club, leather lounges and low lighting, potted palms and red velvet wallpaper. We order a cocktail, but sadly the bar closes 30 minutes later so we finish our drinks and begin the walk home. We tumble into bed around 3. Today we decided that we should visit Nancy. We left late and drove there on the motorway, arriving around 1pm. 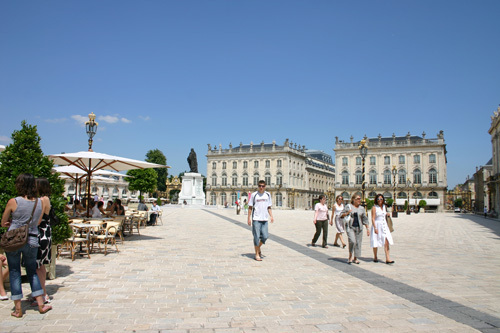 Nancy is reputed to be one of the loveliest of French cities, and it is certainly worth a visit. 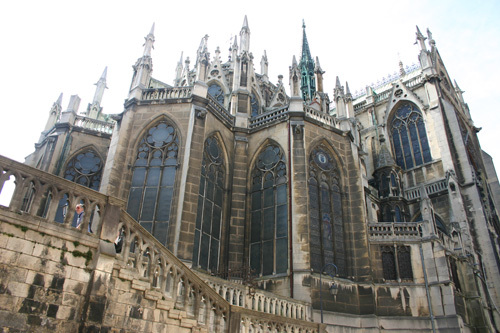 It achieved prominence as the capital of the Duchy of Lorraine, which was held by most of the French princes before they became king. 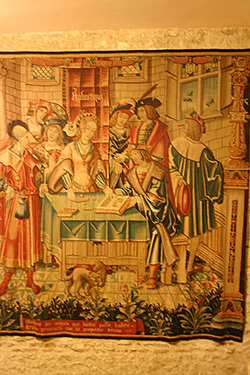 The last Duke of Lorraine was Stanislas of Poland, and on his death the duchy became a French province. 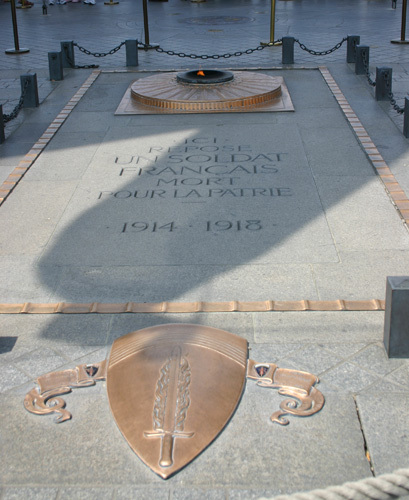 When the Lorraine was created in the middle of the 20th C, Metz was made the capital. 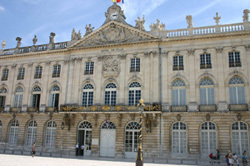 Nancy is the capital of the prefecture (department) of the Meurthe-et-Moselle. It has some lovely sights. We parked in an underground car park under Cours Leopold and walked into the old town, looking for a restaurant for lunch. We found one in one of the pedestrian malls. I had the confit duck as it was the special, and I think the boys had steaks. It was very nice lunch, colourful placemats, good service and well-cooked food, plus a nice rose! 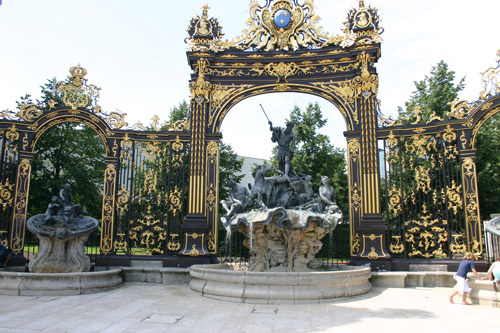 We then headed for the tourist office in the famous Place Stanislas. We walked around the square, admiring the cafes we had obviously missed out on, and went up towards the New Town. However, we decided to stay in the Old Town instead. 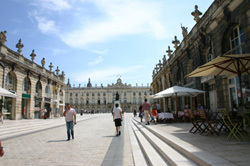 The Old Town is that part of Nancy that expanded rapidly in the Middle Ages around the Duke’s castle. In the 16thC the most modern defensive walls and bastions of the period were built to protect it. Nothing remains of them today except for a small part of the walls discovered during the renovation of the Fine Arts Museum. We went up one of the wide clean shopping streets to an internet cafe. After a brief surf (and this internet cafe had 9 ( !! ) brand new iMacs sitting around waiting to be used), we went to get an ice cream and visit the Parc du Pepiniere, where we lay on the grass for a bit feeling the effects of a large lunch! We then looked at our book for the walking tour of Nancy. There are far too many interesting things to see here and we really don't have enough time to see them all, plus my back is killing me again so I am not a happy camper. Anyway, walking is better than sitting which is better than lying, so off we go exploring. 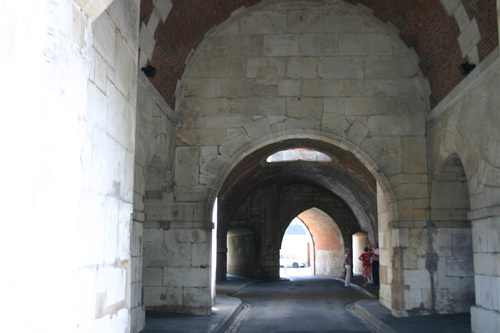 but didn't make it to the gate on the other side, the Porte de la Citadelle. We retraced our steps and came to the Eglise de Cordeliers, the church named after the Franciscans who wear a cord around their waist. The church and the monastery beside it date from the 1470s. We walked around this, although there are some renovations going on to the adjoining monastery, then continued on to the Ducal Palace. 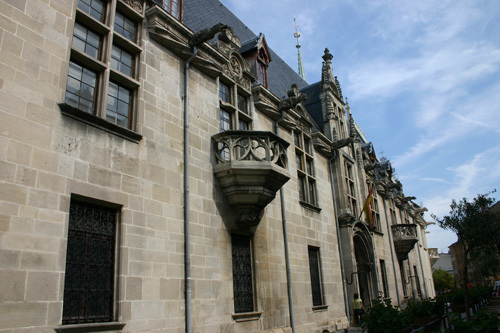 Built in the 15thC, this was originally the residence of the Dukes of Lorraine. Abandoned by Duke Leopold, who moved to Lunéville in the 18thC, it became the Lorraine Museum in 1848. All that is left is part of a wing and a doorway. At one stage it was used as a stables!! 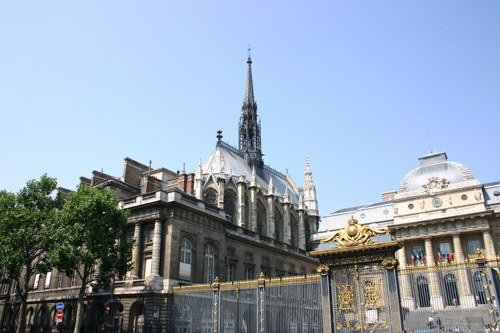 before turning right and crossing the streets to the Basilica de Epvre. This stands in the old market square and general trading centre of the Middle Ages. It was built in the 19thC by Prosper Morey and is decorated with stained glass and wood paneling in part made in Bavaria. It was richly endowed by Napoleon III, Emperor Franz-Joseph, Ludwig II of Bavaria and Pope Pius... who donated the beautiful stone paving in the choir that came from the Appian Way. 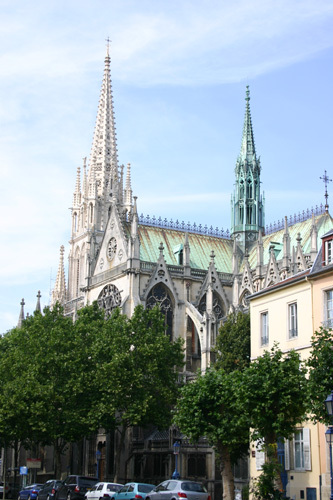 After walking around the Basilica we went in search of the Art Nouveau for which Nancy is also famous. On our way we passed the Haussonville Mansion. The Haussonville Mansion dates back to the 16th C and is one of the most beautiful houses in the Old Town. 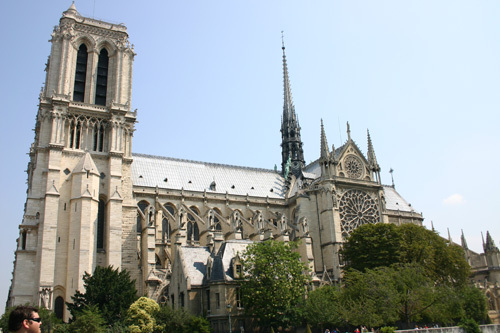 It is built of two main parts set at an angle. 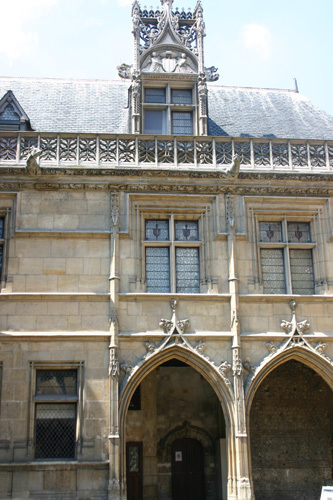 There are two galleries, one of open-stonework in the gothic style running along the first floor, and the other in the renaissance style along the second. 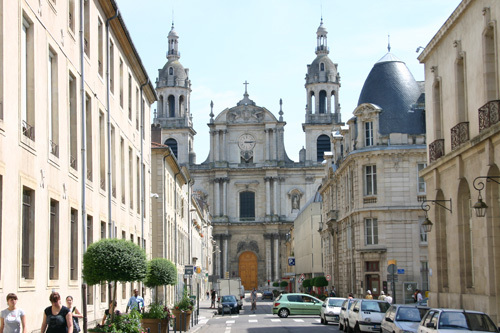 We left the old town section of Nancy, and here's a last photo of Nancy, showing the New Town. Founded by Duke Charles III in 1588, with its streets all at right angles the New Town has a totally different layout to the Old. 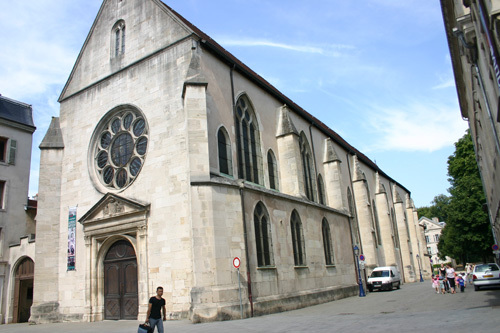 It has its own market square and a famous parish church: the Primatial (today’s Cathedral). It was in a position to rival the Old Town as it even had its own independent fortifications. We then left Nancy and headed back to Vandieres. 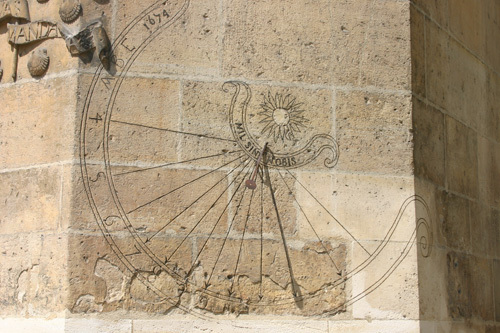 We have decided to leave at the crack of dawn tomorrow in order to maximise our time in Paris. We've made arrangements to have the house inspected and get back our deposit tonight. After we did that we headed back to Pont a Mousson for a last dinner. We ate in a delightful cafe full of locals, and our waiter was a lovely young man whose dream it is to come to Australia. I had a fabulous flammekuchen. Our last night in the moulin, and we are all packed before we fall into bed, ready to be up and away early. Today we have been invited to lunch at the Chateau de Puxe, where the owners of the Moulin de la Thuile live. The moulin used to be their home for many years, and they farmed the land around the house, but 5 years ago they bought the Chateau and turned the moulin into a holiday gite. The Chateau is a Ferme Auberge, meaning that 70% of the produce eaten there comes from the land they farm, and they have a license to prove it. The chateau is about 45km from the moulin, so we drove over and arrived about 12.30. We were met by the owner, Agnes Choné and her husband, her youngest son and daughter. There are 2 other sons, one lives in Lille and the other was working on a neighbouring farm during the holidays. 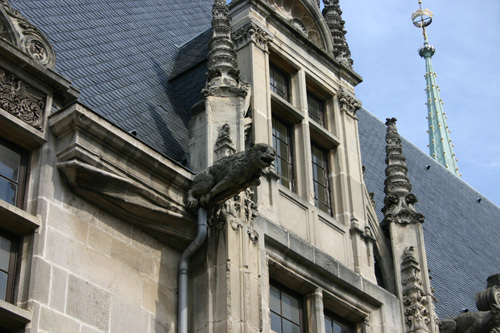 The Chonés do not live in the Chateau. 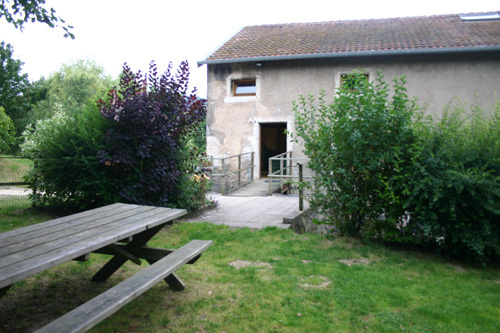 They have converted the left wing into a B&B with 5 rooms, and the right wing into 2 apartments of 2 bedrooms each. The central wing is unrenovated and empty. There is a large dining room and kitchen under the apartments in the right wing, and this is where they serve the Ferme Auberge meals. They actually live in the farmhouse beside the chateau. The Chonés are a really lovely couple and their daughter is vivacious, intelligent and has great English! First we were given an aperitif to drink. It appeared to be cherries and an eau-de-vie in champagne, and was a bright red colour. Very tasty and a trifle alcoholic. We chatted in French – I am the only French speaker of the 4 of us, and their daughter was the only English speaker of the 4 of them. She has just spent a year travelling around Australia and working here. We then sat down, all 8 of us together, and a large puff-pastry packet containing leeks in a lovely cheese sauce was served. Extremely tasty. G had chosen a Nuits St George from the wine-list and that was absolutely delicious with it. After the leek pastry, we were served with lovely country roast chicken (home grown) in a tasty sauce, with beans, potatoes, carrots, onions and peas, all from the farm. Agnes is a fabulous cook and was recently on French television cooking just this chicken dish. After this very tasty meal came a cheese plate, containing some goats cheeses, some lovely blue and a creamy camembert. We ate this with a fresh green salad and the bread that had been served with lunch. After this, Agnes brought tall glasses of dessert, home-grown and home-cooked Mirabelle plums (which are unique to the Lorraine) with cream and ice-cream. Her husband bought out a cremant from the south, made by Agnes' brother, which was lovely with the dessert. We then had coffee and some home-made mirabelle plum brandy. The meal was absolutely delicious, and the company wonderful. Although only I spoke French, the daughter spoke excellent English, which meant that my family were included in the conversations. But I made an attempt to speak French at least half the time, so that Agnes and her family could also feel included. After lunch Agnes presented us with a bottle of mirabelle plums in syrup and a bottle of mirabelle plum jam, both of which she had made herself. They then took us on a tour of the farm, showing us the greenhouses, the little stream and the sheds where the chickens and guinea-hens live. The chickens and guinea-hens eggs had just hatched, so we held one of these tiny animals each. The guinea-hens are particularly lovely. We left about 4 as the family had to be in Metz by 5 to deliver some vegetables. It was a fabulous day, and such an honour and a privilege to be included in the life of the family for a day. It is moments such as these that make a holiday truly memorable.